New Balance’s marketing pitch: Designed for movement that feels fast and free. Upper: Engineered mesh, fused layers. Midsole: Single density Revlite EVA foam. 10 mm heel drop. Widths available: D - regular (reviewed). 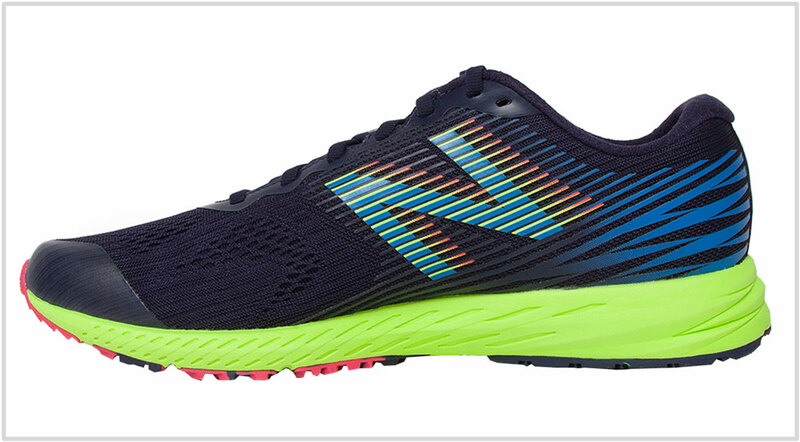 New Balance's lightweight trainer/racer retains the fast ride of the previous versions, and its upper takes the minimalist design route. 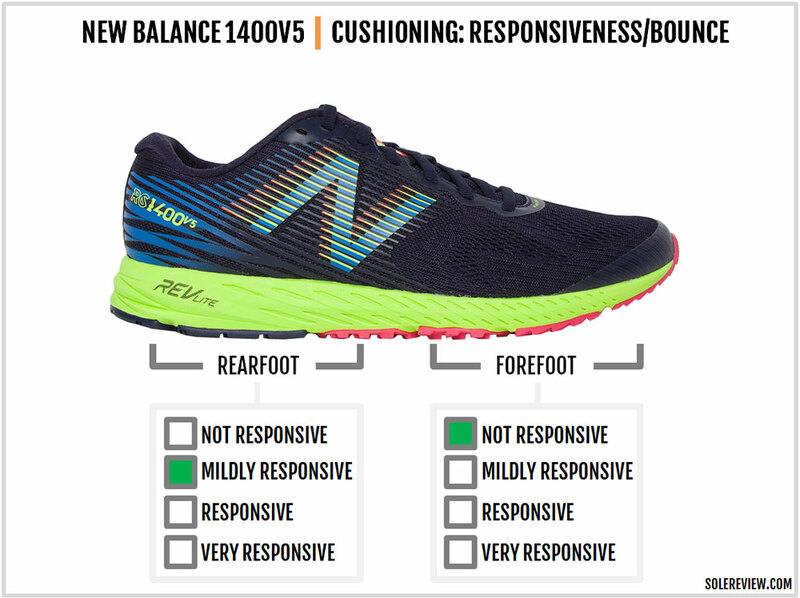 New Balance has quite a few models in its Racing-Competitive category, also called ‘RC’ for short. This assortment has a slew of lightweight racers and spikes which sticks to the brand’s legacy numbering system instead of proper names. We don’t cover spikes at this time, but we’ll spend a little time discussing the non-spiked lightweight trainers within the RC construct. At the time of writing this review, there are three models which fit the description. The first is the 1500, a model which we’ve often reviewed on the site. The 1500 is a lightweight trainer with a twist; it has a small (but unobtrusive) medial wedge embedded in its midsole. The 1500 has a decent amount of midsole stack, so it isn’t a pure racing flat. The second shoe is the newly released Hanzo. This is a purist’s racing shoe which features a thin, 4 mm drop midsole and a super-grippy DSP (Dual Stencil Process) outsole, all packaged in a hyper-light 6.5 ounces. There’s a product gap between the Hanzo and the 1500, and that’s where the RC 1400 V5 comes in. It’s a slightly trimmed down version of the 1500 in a neutral guise, and its 10 mm drop midsole packs enough cushioning for fast training runs, but firm and light enough for 5K, 10K races, and all the way to a half-marathon if your feet and mind are willing. The 1400 isn’t a thoroughbred racing flat considering that a lot of midsole separates your foot from the ground. But not everyone wants to run in racing flats, so that’s where the 1400 and 1500 come in. Before the Hanzo came along, New Balance used to have the RC 1600 which is now apparently discontinued. But if the 1600 were to exist today, it would be the shoe bridging the narrow gap between the Hanzo and the 1400. 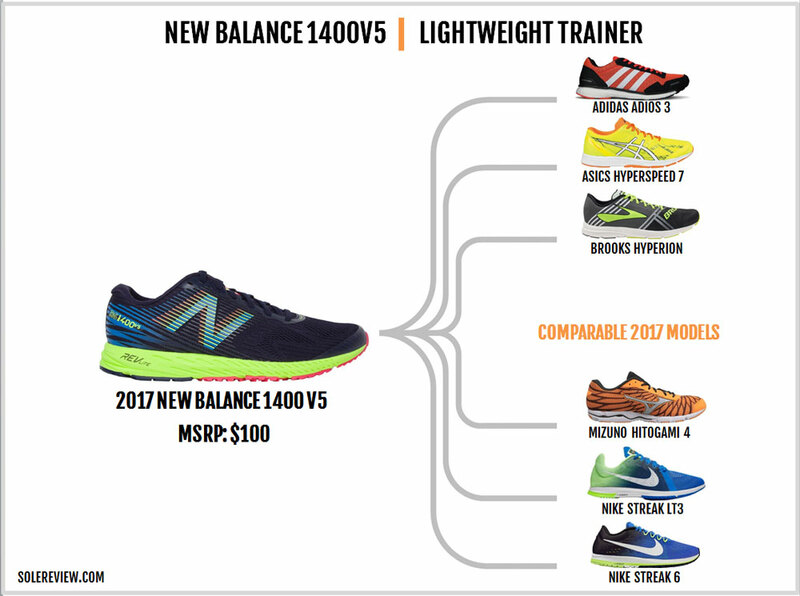 Most running shoes, like people, change over time, and the 1400 is no exception. Now in its fifth year, the model has gone through numerous design iterations, losing some followers and gaining new ones in the process. 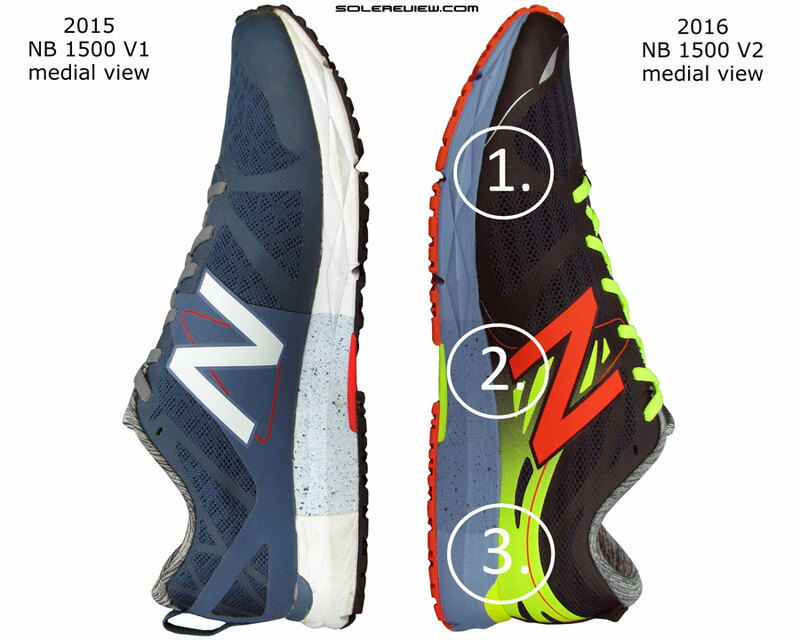 The 2017 New Balance 1400V5 bears little resemblance to the first few designs. The V2 for example, had a uber-breathable upper with lock-down provided by a network of synthetic overlays. The V3 took the V2’s fit, but replaced the cheese-hole mesh with a regular spacer one which had lots of stitch-less overlays. 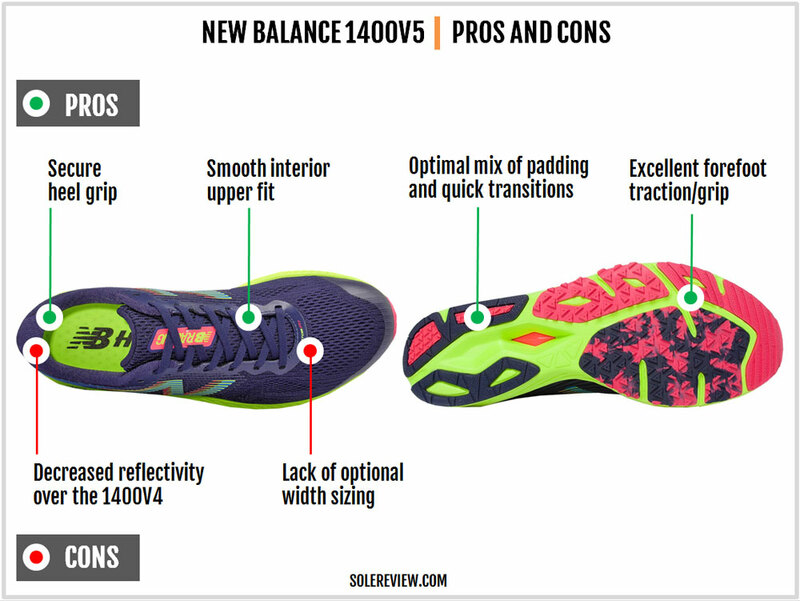 Last year, the 1400 V4 gained a bit of weight, adding more structure to its upper and aligning the overall design with the 1500. All said and done, the ride quality has stayed more or less the same through the years. All 1400 versions have had a single density midsole made of New Balance ‘Revlite’ EVA, a material also used on the 1500. And what’s new on the 1400 V5? A lot, we’d say. There’s a new upper which cuts down on all the layering, and delegates the fit and support duties to a combination of engineered mesh and a minimal set of thin overlays. While the midsole is still a single sheet of Revlite, the outsole update results in the grippiest 1400 ever. Unlike the past 1400 versions which relied on a lot of fused overlays to provide structural support, the new 1400 is all about keeping things minimal. The contrast is obvious when compared to the V4. We’d admit, though, that the V4 had an unusually high level of external layering for a 1400. The V4’s heel, for example, had a thick, stitched-on overlay, accompanied by lots of fused synthetic over the midfoot and forefoot. The 1400V5 gets rid of all that. It changes the upper material from the spacer mesh of the older 1400’s to an engineered mesh. This design approach allows the mesh to have vented and close-knitted surfaces on a single component without relying on external overlays. 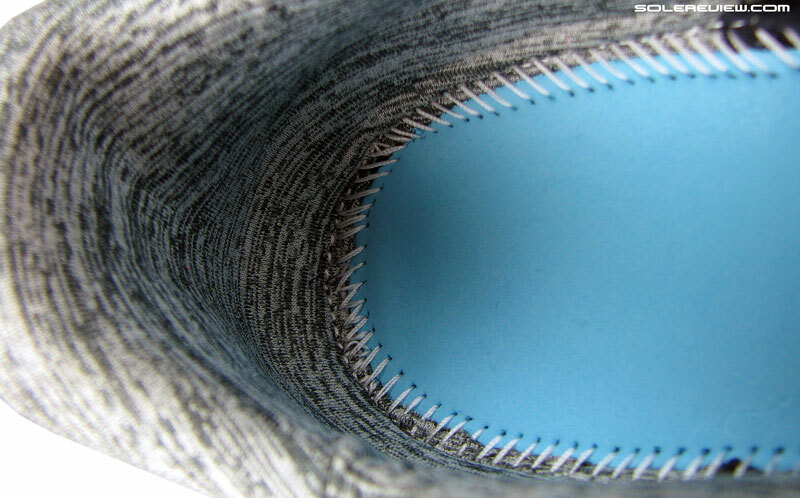 Only the heel center retains a vertical strip of stitched synthetic. This also means the most of the reflectivity of the V4 is gone, replaced by the somewhat shiny ‘New Balance’ font printed over the heel. The toe-box and forefoot have larger vents for letting air flow better, while the rest of the upper has a close-knit design. The new mesh has a bit of squeeze compared to the previous spacer one, so the upper feels better over the foot. The only downside is that the shoe looks droopy when not worn. With most of the external overlays gone, the upper tends to sag under its weight. The only areas where the fused synthetic has been applied are the toe-bumper and the lacing eyestay. The toe-bumper is now a shorter version of the V4’s design, and extends over the forefoot on the big toe side. It’s a wise design choice to keep the lacing area reinforced with synthetic, as it prevents the eyelets from tearing. The laces are the standard flat ones with a bit of stretch in them. These spread top-down pressure evenly and stayed tied during runs, so it’s good to see them unchanged. The tongue has minimal padding and has no sleeve. But there’s no tongue slide. This is due to the 1400’s narrow lacing, a set-up where the opposing eyelets come very close together when laced-up. This allows the tongue to be locked in its position by the very wide center lace-loop. The interiors are by far the smoothest in the 1400’s history. The complete lack of thick overlays allows the insides to be seamless, making the 1400 suitable for sock-free runs too. A internal stiff counter wraps around the heel, and the collar has minimal padding. There’re a couple of updates over the V4 in that area. The collar gets a new fabric lining which is soft, but different than the cottony melange type used on the V4. The Achilles dip is also slightly lower, though this does not affect the fit in a negative way. Save for the cosmetic details, not a lot has changed on the 1400’s 10 mm drop midsole. It’s got a single-density block of EVA which New Balance calls Revlite. 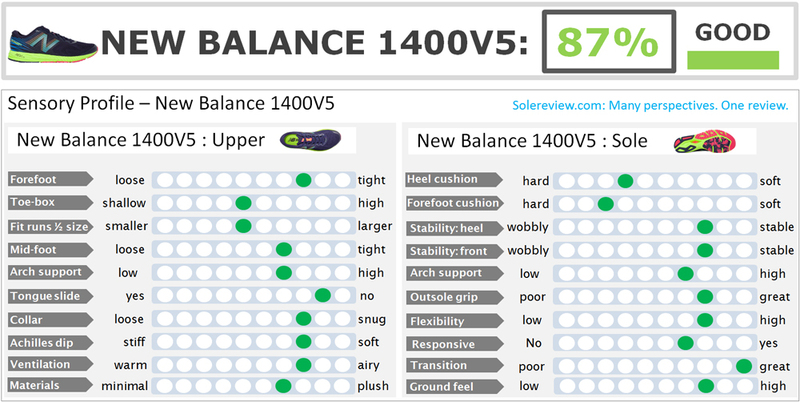 The volume of foam is similar to the one used on the 1400 V4, and the sidewalls get updated details. Instead of the angular grooves and cuts of the V4, the 1400V5’s midsole has small rib-like details which match up with the graphic on the upper. This compression molded foam is neither too soft nor too firm, which is fitting given the 1400’s fast-shoe positioning. 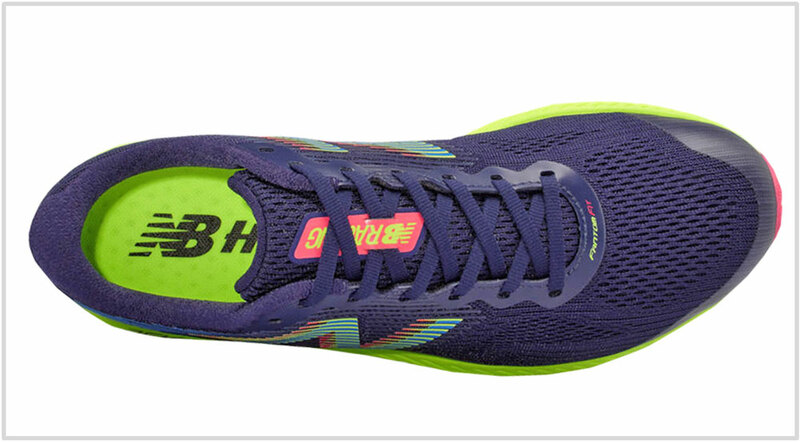 There’s a perforated (and removable) insole inside which adds an extra layer of cushioning. 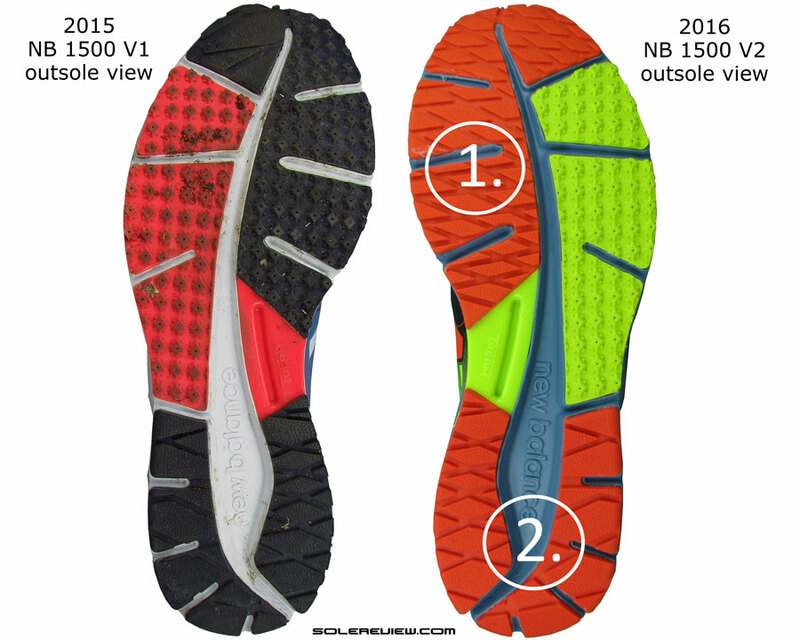 This is the same insole used on the V4, and also on the 1500 series. The basic outsole design hasn’t changed in a few years. Thin slabs of rubber are placed flat over the Revlite midsole to result in a near-full contact surface. There are some areas of exposed foam under the heel and midfoot, but the rest of the surface is rubber. The rearfoot gets a two-piece set up of hard rubber, whereas the front is covered with softer blown rubber. That’s where the similarity with the V4 ends, however. The forefoot outsole geometry gets a radical design update. A new groove splits the forefoot outsole into two side-by-side halves. This wasn’t the case on the earlier versions of the 1400, and it seems that the V5 has taken inspiration from the medially-posted 1500. Not only is the split forefoot similar looking to the 1500, but the lug design also shares a common template. This year’s 1400 gets a colony of tiny lugs on the forefoot slabs. This wasn’t so on the V4, which featured wide rubber slabs without a groove dissecting them. As a result, the 1400V5’s road manners have a lot more grip on road and track than the V4, or for that matter any of the past 1400’s. 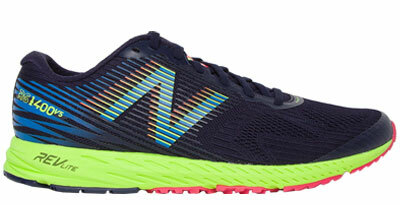 What New Balance doesn’t mention is the presence of a small midfoot TPU piece. This is placed above the midsole, and contributes to the torsional rigidity of the 1400. For all its lightweight appearance, the 1400 isn’t as fragile as it looks. You should be able to squeeze 300 miles out of the shoe easily, probably more. The smaller lugs tend to wear faster than the bigger slabs of the previous 1400’s, though the rate of wear will gradually taper. Revlite and the insole are still EVA foam no matter what New Balance claims, so expect the foam to go all wrinkly and flat after a couple of hundred kilometers. 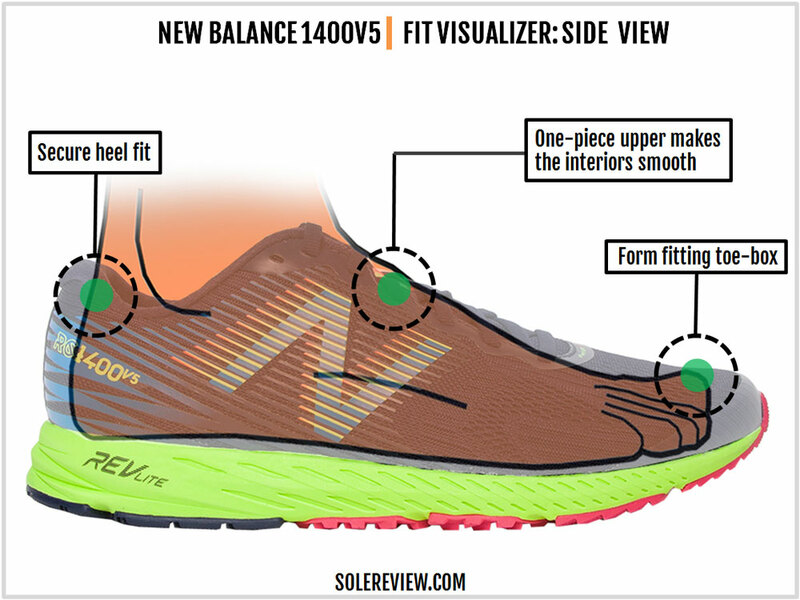 In other words, the 1400V5 will get closer to a racing ‘flat’ feel at mile 200 than mile 10, so not sure whether the midsole flattening is a bad thing. The toe-box is shallow, so get a half size larger if you want to preserve the toe-box mesh. Else, friction with the foot might lead to a premature failure of the mesh material. 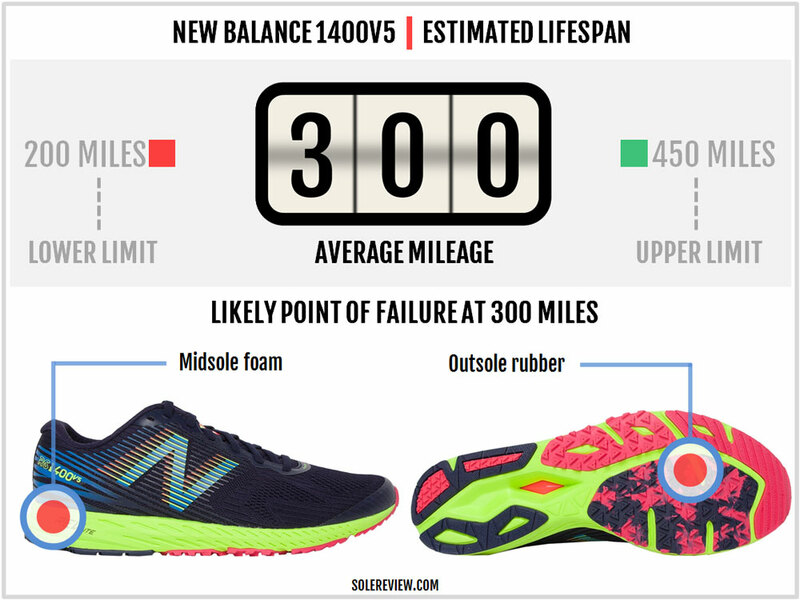 There’s a good reason why the 1400V5 is in New Balance’s ‘RC’ category. Apart from its light weight, the upper is form fitting – a characteristic of road racing shoes. A narrow fit keeps the foot locked down and minimizes distraction. 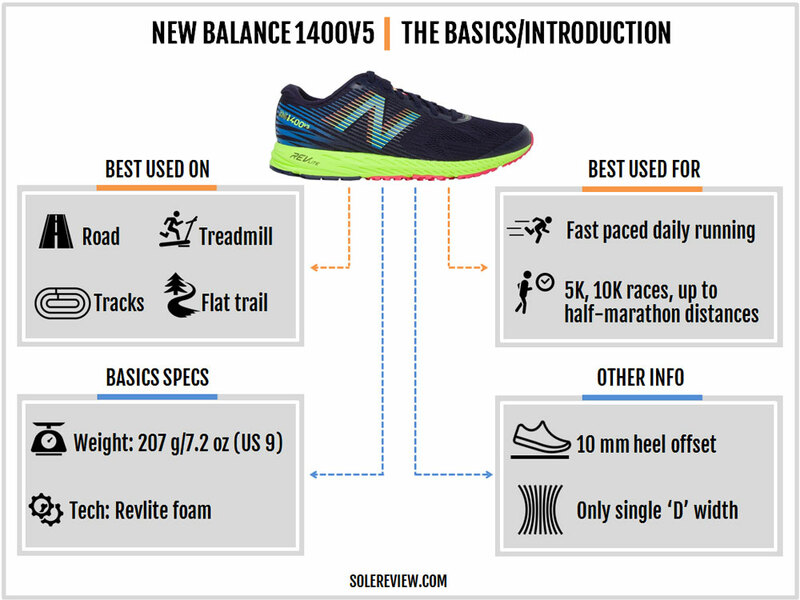 On the other hand, if a shoe such as the 1400 is one of your first, then know that the fit is different than a daily training (like the New Balance 1080 or the Nike Pegasus). When compared to traditional trainers, the 1400’s toe-box is shallow, the front end is pointy, and the forefoot is narrow. But on a scale relative to the 1400V4, the new V5 has a slightly more accommodating fit. We mentioned that the forefoot and midfoot go through numerous changes, such as a smaller toe-bumper, the reduction of side overlays, and the softer mesh. One can’t have all these tweaks and not expect a change in the upper fit at the same time. It is no surprise that the foot doesn’t feel hemmed in as it did inside the V4. The engineered mesh is softer and will expand slightly over time. The new toe-bumper is shorter on both sides, so the front isn’t as pointy. The insides feel way smoother than before too; overall, the V5 feels more spacious inside than the V4. This doesn’t mean that the upper lacks support. The 1400 has a thin waist, which means the upper hugs the foot securely and prevents it from sliding forward. The internal heel counter grips well, and the flat laces do a great job of keeping the tongue in place. As called out earlier, the narrow lacing and the ultra-wide center loop keeps the unsleeved tongue from moving around. Whether you buy a half size up on the 1400 or not depends on the use-case. If your intention is that of reserving the 1400’s use exclusively for synthetic tracks, then we recommend that you stick true to size. But you intend to run 10k and beyond in the 1400, then getting a half size larger is recommended. It must also be noted that the 1400 is not offered in additional widths, so what you see is what you get. The 1400 is a 10 mm drop shoe, which means that the cushioning is heel loaded. 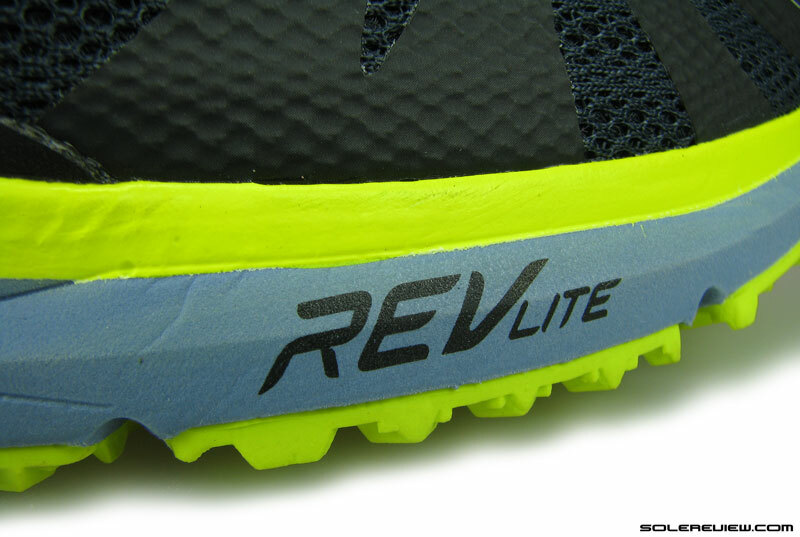 There’s a lot more Revlite in the rear than under the minimally padded forefoot. So your impression of the 1400’s ride will depend a lot on whether you’re a rearfoot or forefoot striker. In the back, three components work together. The perforated insole placed inside comes with inbuilt cushioning, and this provides the first layer of cushioning. 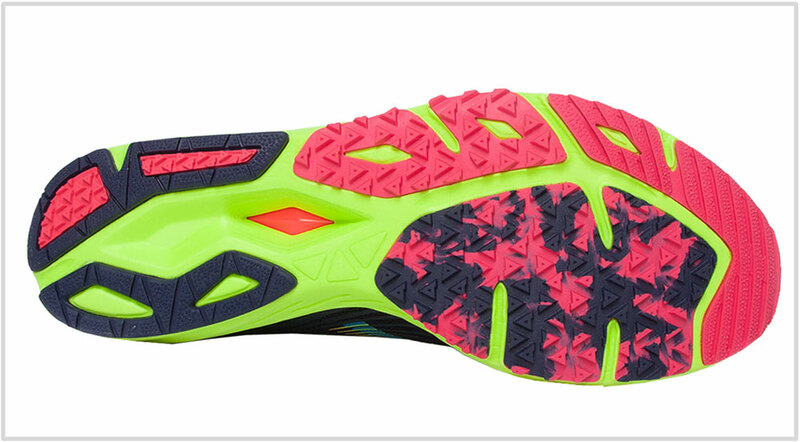 The primary Revlite midsole does a good job of damping the ride without a loss in speed, and the area of exposed foam cavity (under the heel) splays out on impact, adding to the cushioning experience. Even so, we’d still categorize the 1400’s cushioning character as firm with only the slightest responsiveness. The foam doesn’t have a lot of give, and offers excellent ground feedback, stability, and transitions instead. The forefoot cushioning is bare-bones, but not jarring – the soft blown rubber adds a touch of softness when it meets the road. 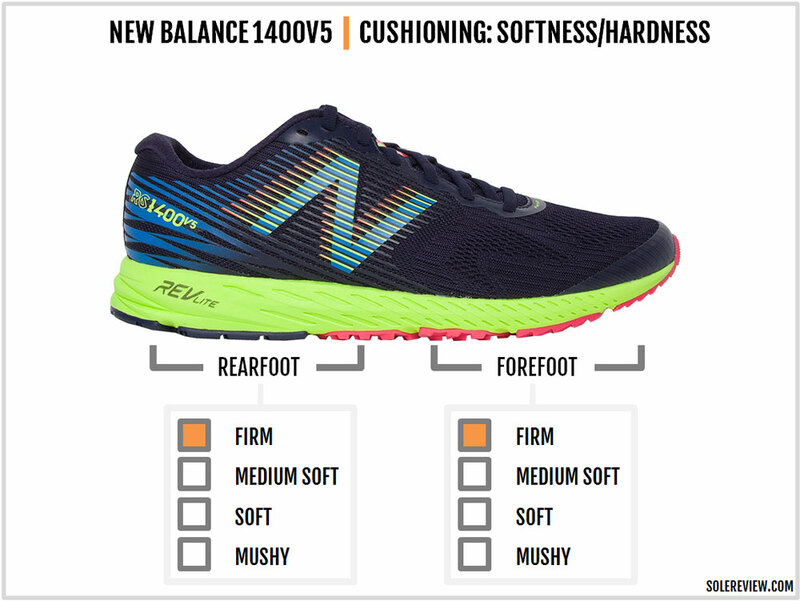 If you’re familiar with other New Balance models, then a good way to describe the 1400’s cushioning quality as being midway between the Zante V3 and the Vazee Pace V2. One might ask – can the 1400 be used for marathons? No one’s stopping from using the 1400 as a long distance shoe which involves running longer than a half-marathon, but the forefoot is thin and will beat your foot down. Also, the fit is narrow, and there are no additional widths, so that’s another thing you need to watch from a comfort perspective. Some use the 1400 on light, non-technical trails where a snug upper works better, but then that’s an entirely different use-case. This is a New Balance, so the first positive which comes to mind is the upper fit. The 1400 might be narrow, but there’re absolutely no pressure hot spots. More so this year than the last, as the all-mesh upper delivers increased breathability and interior smoothness while being supportive. The ride quality is a great mix of firm and cushioned. The single density Revlite EVA offers excellent transitions, and the new outsole grips very well on the road and tracks. This lightweight shoe is also great value at an MSRP of $100. If we had to nitpick, it would be the lack of optional widths and the decreased reflectivity over the previous model. As far as the ride is concerned, both the versions are very similar. That’s because the V4 and V5 both use a single-density EVA midsole of similar dimensions. That said, the 1400V5’s outsole grip is much better owing to the new forefoot lugs. What’s changed a lot is the upper. The V5’s upper leaves most of the external layering behind, which also includes a smaller toe-bumper. The reduction of overlays when combined with the slightly more stretchable engineered mesh, frees up more room inside. 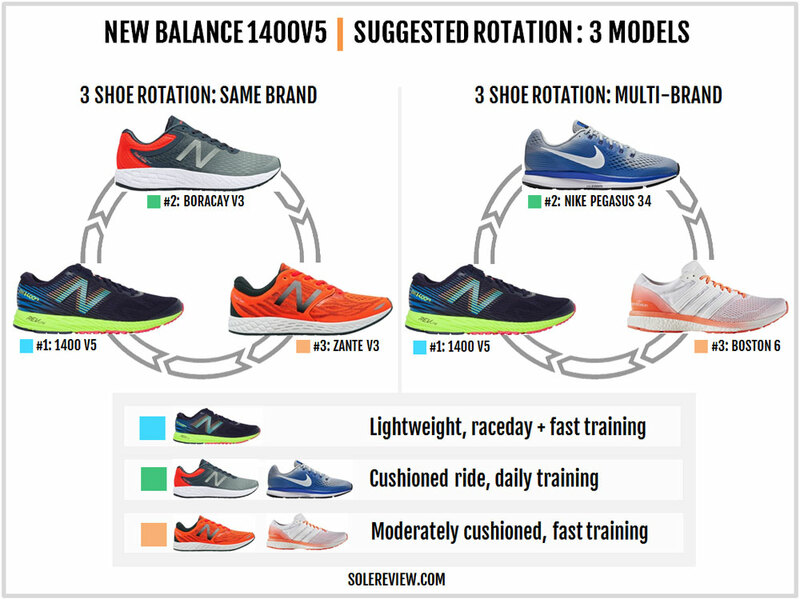 If the 1400 is going to be one of the many in your running shoe mix, then there are a couple of rotational approaches to consider. You can either keep the entire collection minimal and speed focused, or go for a wider range of ride experience. An assortment of the Zante V3, the 1400, and the Hanzo will give different levels of lightweight. The Hanzo is a pure racing flat for quick 5K and 10K runs, while the Zante V3 is a cushioned daily trainer. In between these two, you have yours truly. But we think that the assortment will be more wholesome if you get the Boracay V3, the Zante, and the 1400V5. This way, the 1400 can be used for races and very fast runs, while the Boracay can perform the role of a long-distance hauler. The Zante works great when you want a lightweight shoe but with a higher level of cushioning than the 1400. If you seek brand diversity, then consider the Nike Pegasus 34 and the Adidas Boston 6. The Nike will give you all the cushioning you need for longer runs, while the Boston is a good in-between shoe for fast-paced daily training. 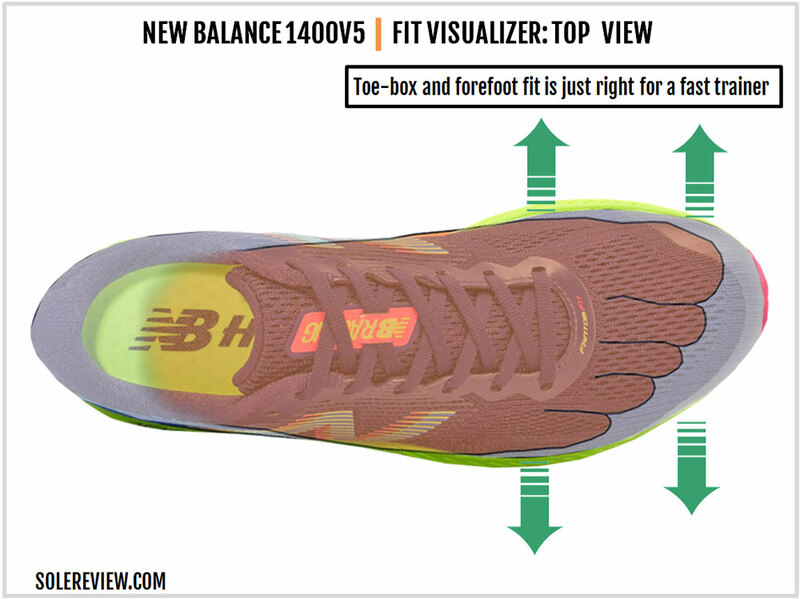 Regardless of its ‘RC’ tag, the 1400V5 is not a full-blown racing flat; the 10 mm heel drop is a dead giveaway. It is undoubtedly a fast trainer, but has adequate padding underneath, much unlike a racing flat. The 1400 is a level or two above the racing flat silhouette as far as road manners go. There are many other shoes within that category. There’s the Asics Hyperspeed 7, the Brooks Hyperion, and the adidas adios 3. The Mizuno Hitogami 4, the Nike Zoom Streak 6, and the LT3 are a few other options. Needless to say, each of these come with their distinct ride and upper fit character. But if we had to choose just one shoe which is a closer match with the 1400 than the rest, it’d be the Asics Hyperspeed 7. The latter’s upper fit shares some of the 1400’s traits, along with a single-density midsole and a transition groove which splits the forefoot – much like the New Balance 1400V5. Do you own this shoe? Improve this review by sharing your insights – submit a review here.